Mom’s quilt is coming right along, and I’m really liking it. I hope to get all the purple areas done today. Then on to yellow. Yesterday, I finally got fed up looking at our beaten down, dilapidated, much used and abused sofa. DH & I took a trip downtown to the local furniture store. I have a pretty, dark brown leather sofa and chair and ottoman coming. Woohoo! I can’t wait til they are here. He had a sofa and loveseat on the showroom floor, but I wanted a chair, so he ordered them both in so the dye lot would match. I was hoping to have a sofa yesterday, but oh well, what’s another couple of weeks. Jan had this in her blog, and since you get more chances to win by referring others, I am posting it in my blog, also. 😉Sharon Schamber is giving away a quilt! 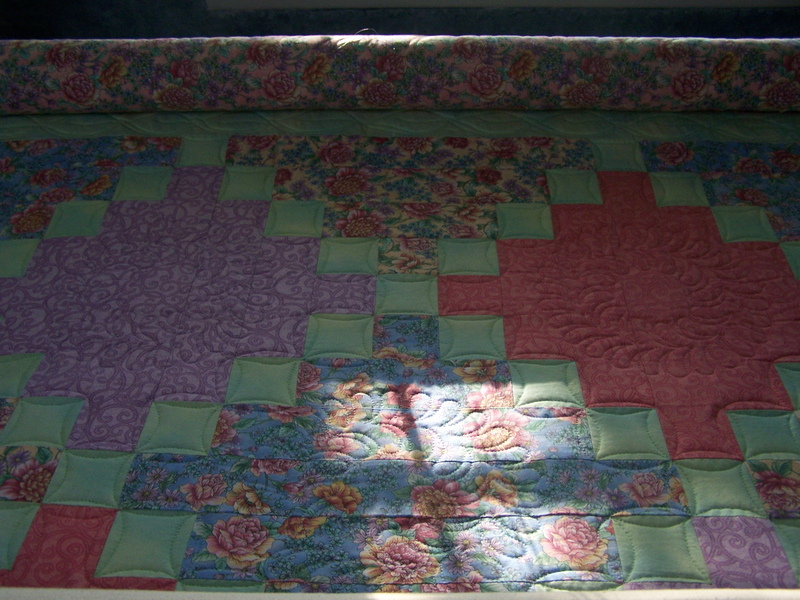 How cool would it be to win a Sharon Schamber quilt?! All you have to do is sign up for her new network. Click on her name for details. Also, I want to give a shout out to one of my favorite blogs to visit. Carla is a very talented artist and all around good people! Her blog is always a great time. She can be found at Feathered Fibers. No!! Click on it from my blog ROTFL 😉 You’ll love the brown leather furniture. We bought the same about 7 years ago and it still looks as good as the day be bought it even with 2 long fur dogs and one small child. Can’t wait to see what you do with mom’s quilt! Oh good, Jan! That is encouraging…one reason I wanted leather is that I’m sick of the dog hair sticking to the other one. I am concerned about the leather holding up to the doggy toe nails, though. It will be nice to sit down on the sofa and not be able to make dust fly out when you pat the cushion…gross huh? I can’t wait. I just can’t kick poor Libby the Lab outside…she is so spoiled, but what a shedder. Randi, I signed up on Sharons network & messed up & put Randi’s blog in stead of Randi A. duh? I hope she knows your blog! LOL Nancy! Hey, at least ya tried to give me another chance! Thanks! OH, Randi – as soon as your new furniture arrives please post pics. I’m thinking off replacing ours once we get the new flooring down – I’m like you – a bit tired of the “dog hair” look. My big yellow lab Rudy reminds me of Pigpen on Peanuts – just pat him and yellow hair flies everywhere. His favorite thing to do is to rub along the back of the love seat and sofa in the den – and they act like a hair magnet! Love the quilt. Want to see the whole thing. Your cc is really good. Congrats on the new furniture. A new couch is on my list.